Interview with Dan Treanor conducted December 2010. 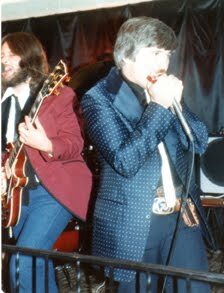 In 1979 Dan Treanor was living in Pueblo, doing a few gigs here and there, playing his harmonica with a young Carlos Crull on saxophone, and an even younger Jimmy Stuckey on guitar and vocals, drummer Mike Green and, on occasion, the Quintana brothers, Bob and Bernie. "We were playing around at the usual joints, Jerry's, The Midtown Lounge, and The Red Rose," Treanor said. "It was a real casual band. I'd book a gig, call up the guys, and we would show up and play." Treanor began writing original compositions. He felt the band could record a few as "something fun to do." They met at Treanor's home and recorded on a 4-track Teac machine. They invited Curley Dockins, a Nashville pedal steel player, Rodney Shields on percussion, Doyle Thrantham on fiddle, and Pete Leri on harmony vocals. "The recording session kinda turned into a party, if I remember correctly, but it turned out great - so we decided to put out a record," he said. 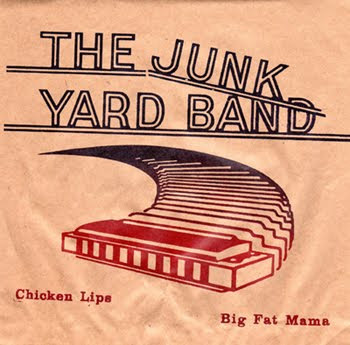 They dubbed themselves The Junk Yard Band. 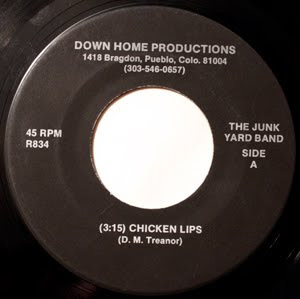 Treanor had 300 copies of the countrified instrumental "Chicken Lips" and the bluesy flipside "Big Fat Mama" pressed. 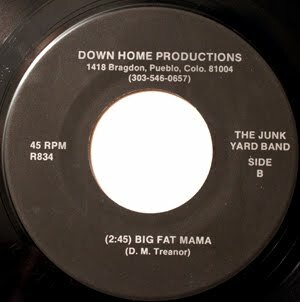 Listen to "Big Fat Mama"
"We sent copies to the local radio stations, and it was played a few times on KKFM radio. About a year later I was in Grand Junction doing a gig. We went into the local Wal-Mart, and suddenly I hear "Chicken Lips" being played over the store sound system. Evidently it was a hit in Grand Junction." In 1980, the band was invited to play with George "Boogie Woogie" Daniels at Pueblo's first annual Juneteenth concert. Shortly thereafter, the group disbanded. "I moved to Denver. Carlos still lives and plays in Pueblo (The Crew, Carlos Crull Trio and Abraxas). Jimmy moved to Kansas City and continues to play music there. Mike moved to Arizona and I lost track of him. Bob Quintana passed away a couple of years ago." In 1983 Treanor became a member of the short-lived Strange Cargo. "I continued to play 'Chicken Lips' and 'Big Fat Mama' in many of the bands I worked in over the years," Treanor said. "In 1994 I re-recorded 'Big Fat Mama' with my band Arc Light for the Cold Shot Of The Blues CD. Dan Treanor currently keeps busy with Dan Treanor and the Afrosippi Blues Band – considered one of the top blues bands in Colorado, playing about 200 concerts a year. His latest solo CD, My Blues Diary was released last year. Interview with Rod Pringle conducted November 2010. 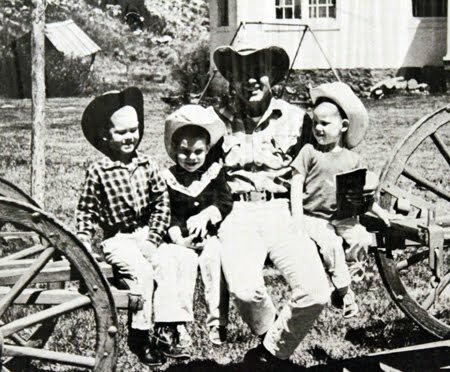 Rod Pringle and his brothers grew up in probably one of the most unique settings in Colorado - on a dude ranch. Located almost 30 miles north of the nearest "big city" (Gunnison), the isolation was hardly solitary. Waunita Hot Springs, entertains thousands of guests every year. When Pringle wasn't helping his parents, or going to school, he gravitated toward music. "I was playing the piano when I was five. When I was ten, my dad bought me a guitar." He instantly took to composition, writing songs prolifically. "I’m a passionate, emotional person. I had 15 songs for each girlfriend I was madly in love with," he said. But the singular interest didn't last for long. "I remember, oh I must have been a junior in high school, I was sitting on the stairs of my home, playing the guitar, and my middle brother Wes picked up the harmonica. I thought that sounded pretty good together. Then my younger brother Ryan picked up an old stand-up bass, and being brothers our voices blended." But before the brothers could really pursue their musical destiny, Rod Pringle had another calling - college. He enrolled at Abilene Christian University, in Texas, and was almost instantly homesick. "When you are growing up in the middle of the mountains, and you leave, I was thinking 'What the heck was I doing leaving Colorado?" So he came back home. "I went to school a few other places, and then my brothers Wes and Ryan decided to go to Abilene Christian - so I went back to Texas." The reunited brothers picked up where they left off. The group also expanded, adding Wes Pringle's wife, Kari. "Wes married Kari when they were in school. She is a great singer, and there was the fourth part we were missing." While performing at Crystal's Pizza in Abilene, they were approached by local producer Carlton Dillard, who suggested that the group record an album. "We thought it would be a good idea, and something our parents could give their guests as a souvenir." 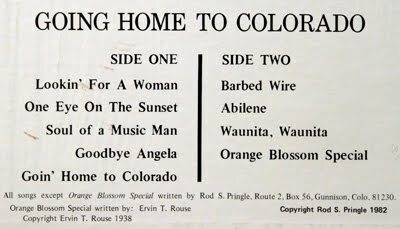 The album, Going Home to Colorado, was financed by their parents, and featured eight original Rod Pringle compositions. "We recorded it in a tiny studio, Castle Sound. It was produced by Michael Henry Martin - he was a musical and arranging genius." Martin brought in studio musicians to enhance the week-long recording, including John Woodle on piano, Stan Smith on guitar, Randy Rigney on bass, Mark Edwards, drums, and Mark Kalson on fiddle (see note below). The cover art was shot near Buffalo Gap, Texas – ten miles south of Abilene. An estimated 1,000 albums were pressed. Listen to "Going Home to Colorado." 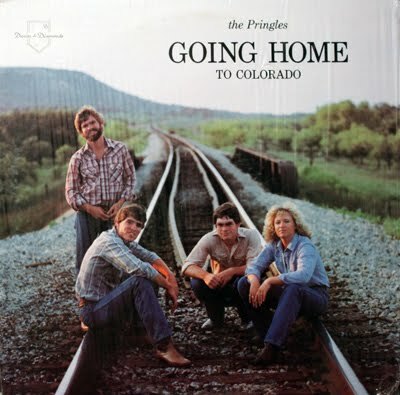 "The album was played on the radio in both Abilene and back home, in Colorado," Pringle said. "They played the song "Abilene" a few times, but even at that time playlists were pretty controlled. They would play the song "Goin' Home to Colorado" on the local Gunnison station." In 1982 Rod also married, and he and his wife Elisabeth later moved to Nashville to try to break into the music business. To support his family, while he pursued his dream, he bought a lawn care business. "I was mowing the lawns of some of the people I was hoping to write songs for like Dave Loggins, Barbara Mandrell, and Sylvia." But after three years in Music City, he decided that the life he had once dreamed of was not all that it was going to be. "I think it’s God's way of saying that I wasn’t meant to handle that kind of life. I don’t have to be famous for my songs to bless one person." Ironically his next move was not going back home to Colorado, but back to Abilene. "Abilene is a great town, and my wife’s family is from here. We’ve been real happy here." The couple would go on to release two Christian music CDs The Race and The Flame, as Rod and Elisabeth Pringle. Their son Logan has followed in his family's footsteps, playing bass in the Austin-based band, Hunters and Gatherers. (Note: Before backing up The Pringles on guitar, Stan Smith played for the influential 1960s garage bands, the Lubbock-based Sparkles, and later the Abilene-based The Chevelle V. Randy Rigney would go on to perform in the band Canyon, who scored the 1989 Top 40 country song "Hot Nights." Drummer Mark Edwards would go on to play drums for Lee Greenwood, Dottie West, and T. Graham Browne. Mark Kalson spent time playing fiddle for Janie Fricke. John Woodle would write music for Floyd Cramer).